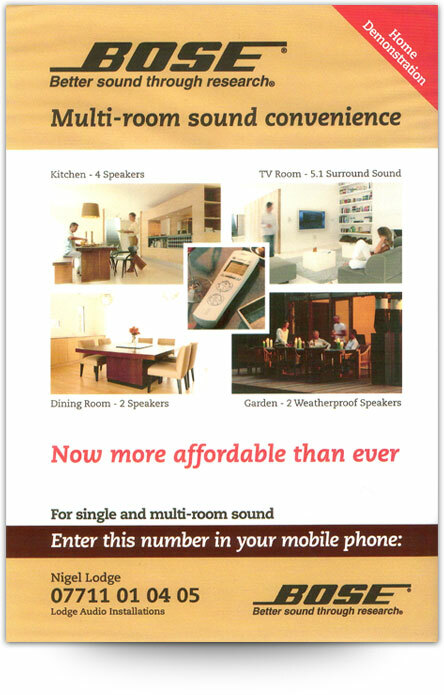 As plumbers in Wakefiled Zone Homes works closely with Nigel Lodge Bose Sound Systems. Nigel Lodge Bose Sound Systems specialise in installing bose sound systems, providing 1st and 2nd fix to hide all of the cables out of sight. Our easy to use Bose Lifestyle music systems employ tiny, coffee-cup sized speakers that can be hidden away out of sight, no need for huge unsightly cabinets. A simple to operate radio handset that works through walls, floors and ceilings allows you to enjoy and control superb music in one or many rooms, for example you can play a CD in the lounge and conservatory whilst the radio plays in the kitchen. You can even have sound in the garden, if you wish. Home Demonstration facilities so you can try the experience - test drive Bose equipment working in your home. If you would like to know more give me a call. With a little notice I can usually make myself available afternoons, evenings and weekends and I will be pleased to put you in the picture. We recommend Zone Homes ltd Builders in Wakefield for all your building, joinery and plumbing needs.